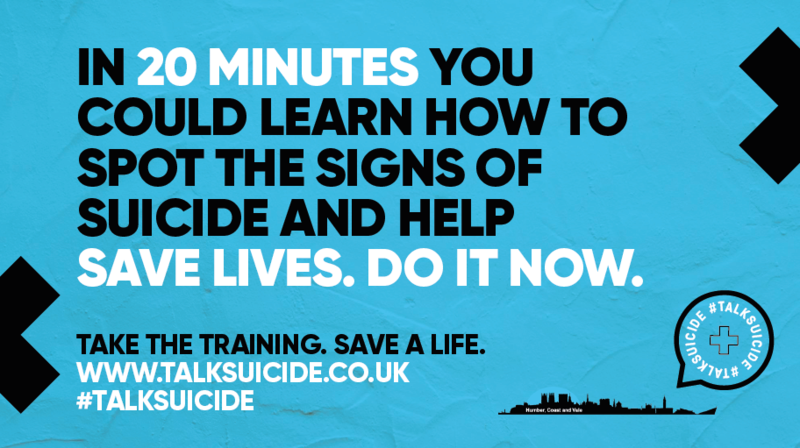 NHS Hull Clinical Commissioning Group (CCG) has joined organisations across the Humber, Coast and Vale Mental Health Partnership urging people in Hull to complete a free suicide prevention online training programme. The Humber, Coast and Vale Mental Health Partnership launched the #TalkSuicide campaign last week with people directed to www.talksuicide.co.uk to complete the video-based training, so they can learn life-saving skills and improve the support network for those struggling with suicidal thoughts. Dr Dan Roper, chair of NHS Hull Clinical Commissioning Group (CCG), said: “Suicide is something that many of us feel naturally uncomfortable discussing, but it’s important to have difficult conversations sometimes. The #TalkSuicide training gives some great examples of how being open, honest and empathetic can make a big difference to someone. The Humber, Coast and Vale Mental Health Partnership is part of the Humber, Coast and Vale Health and Care Partnership – a collaboration of 28 health and social care organisations who are working together to improve health and care across our area. The Humber, Coast and Vale area stretches along the east coast of England from Scarborough to Cleethorpes, incorporating the cities of Hull and York and large rural areas across Northern Lincolnshire, North Yorkshire and the East Riding of Yorkshire, with a total population of around 1.4 million people. Our Partnership represents a new way of working that breaks down the barriers between organisations in health and social care, enabling a greater focus on making the necessary changes to our local health and care services that will improve the health and wellbeing of our local populations.